Hey Beauties! How are you all? 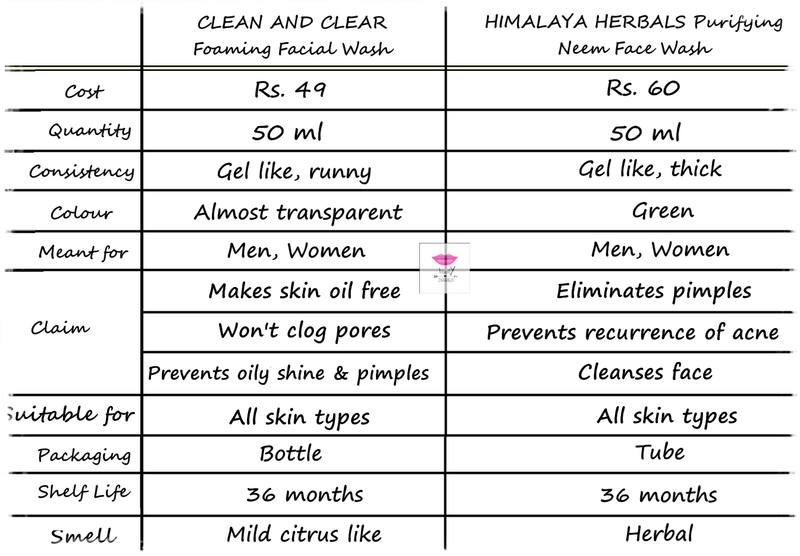 Today I am going to compare Clean and Clear Foaming Facial Wash and Himalaya Herbals Purifying Neem Face Wash for you all. Both of these are really competitive of each other and I’ve heard great comments about them, so I thought why not use them each and feel the difference to share them with you all.. Even though both of these are available in various sizes but I am comparing the 50 ml product of them. First coming to Clean and Clear Foaming Facial Wash, let’s see the main details about the product. Product Description: Clean and Clear Foaming Facial Wash is specially designed to cleanse thoroughly and remove excess oil. Clean & Clear Foaming Facial Wash has rich foam that thoroughly cleanses to remove excess oil and dirt without over drying. Special ingredients help prevent pimples. Leaves skin feeling clean and beautifully clear. Recommended for: Those who want to prevent oily shine and pimples. Directions for Use: Apply a small amount on wet palm and work into rich lather. Gently massage onto face, avoiding the eye area. Rinse off thoroughly. Use twice daily for skin that’s beautiful, clean and clear! Follow with CLEAN & CLEAR skin balancing moisturizer for best results. Product Description: A soap-free, herbal formulation that gently removes impurities and prevents pimples. Neem, well-known for its anti bacterial properties, kills problem causing bacteria, and Turmeric effectively controls acne and pimples. Use regularly for clear, soft and pimple free skin. Recommended for: All skin types, best for acne-prone skin. Directions for Use: Moisten face, apply a small quantity of Purifying Neem Face Wash and gently work up a lather using a circular motion. Wash off and pat dry. Use twice daily. Available Quantity: 15ml, 50ml, 100ml, 150ml and 200ml. 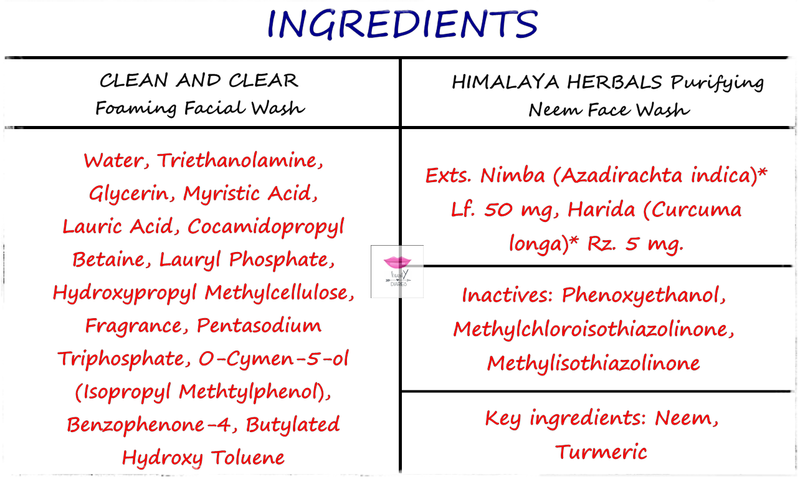 Before sharing pros, cons, my experience and my recommendation about these two products, I would like to share a quick overview about them to give you a better and clearer idea..
Has the goodness of Neem which tackles bacteria from the root and prevents the recurrence of pimples and blemishes. Turmeric that has been used as an antiseptic for centuries is the other key ingredient. Coming to my experience and recommendation, I would like to mention that my and your reviews may not be the same as everyone’s skin type and preference is not same. 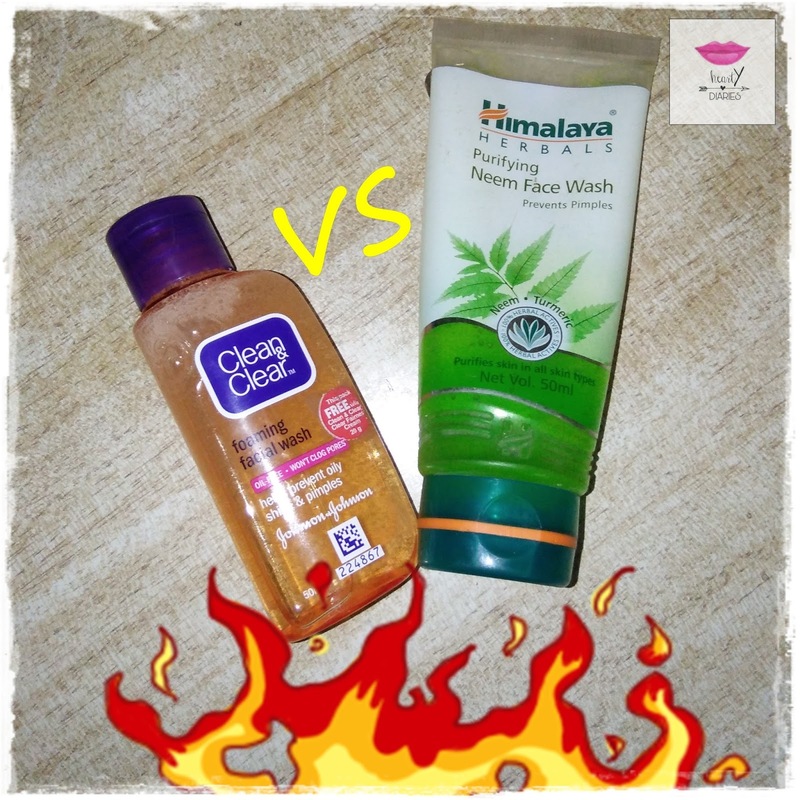 I tend to get excessively oily skin in summers due to what I feel about these two products is actually different from the reviews I have read over the internet. Maybe you may not agree with me, but this is all how I feel and how it worked for me. 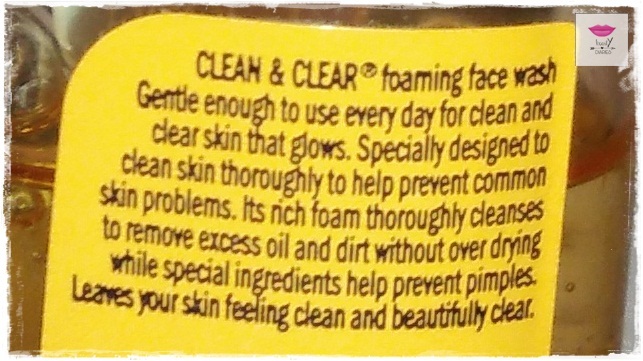 It definitely cleans all the dirt from my face and removes the oil without making my skin dry. It is really gentle and provides a soft and smooth touch to my face but what I feel about it is that it just removes the existing oil on my face but doesn’t actually work on my pimples or scars. Also my skin is extremely oily in summers which I think this facial wash is unable to highly work upon. It removes oil and controls it for maybe just two to three hours but then my skin is back with its oil. It isn’t something that has really reduced my skin’s oiliness. I mean all basic facial washes do the same. They remove the oil and dirt from your face and prevents further oiliness for a few hours and then everything gets back to as it was. It doesn’t do all that it claims. If your skin is oily but has no acne or pimples, go for this face wash to keep your face oil and dirt free to prevent it getting dirty and acne prone. But if you have acne or pimples, I wouldn’t recommend it as it neither reduces nor prevents them. When I started using this face wash, I had really bad breakouts going on which seemed to heal within three days of regular usage. 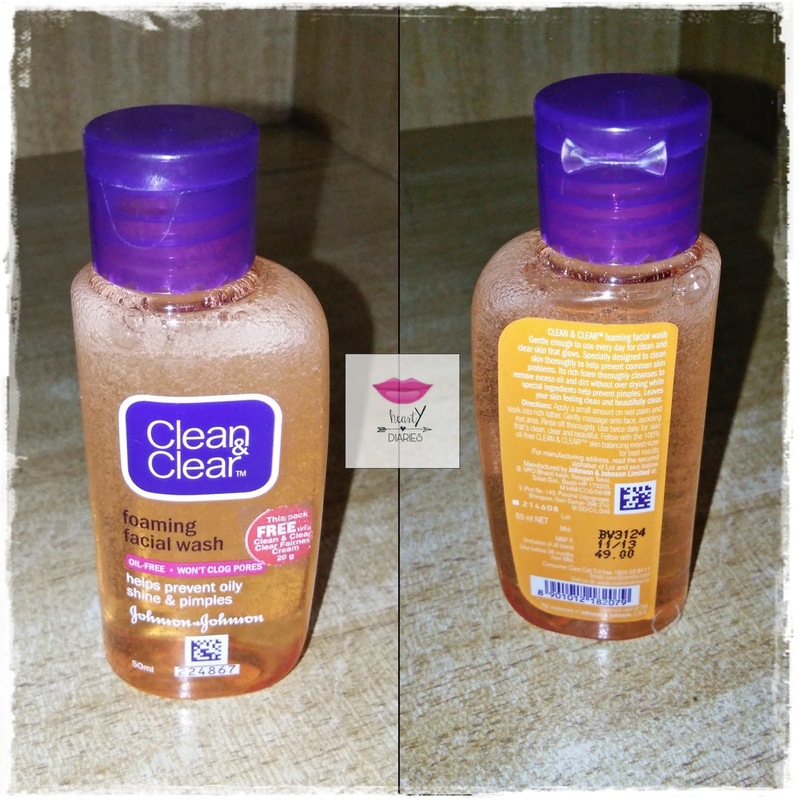 This face wash really worked well for me in comparison to Clean & Clear Foaming Face Wash as it only did the basic job of removing oil and dirt from my face but this one also prevented and healed my acne and breakouts in addition to controlling oil secretion. What I really disliked about it is that it doesn’t lather really well due to which the product doesn’t lasts long but I think that is great as well because natural and herbal products do not foam much. I don’t mind buying it again and again because it is not very costly even though it is a little expensive as compared to Clean and Clear. It does all that it claims. 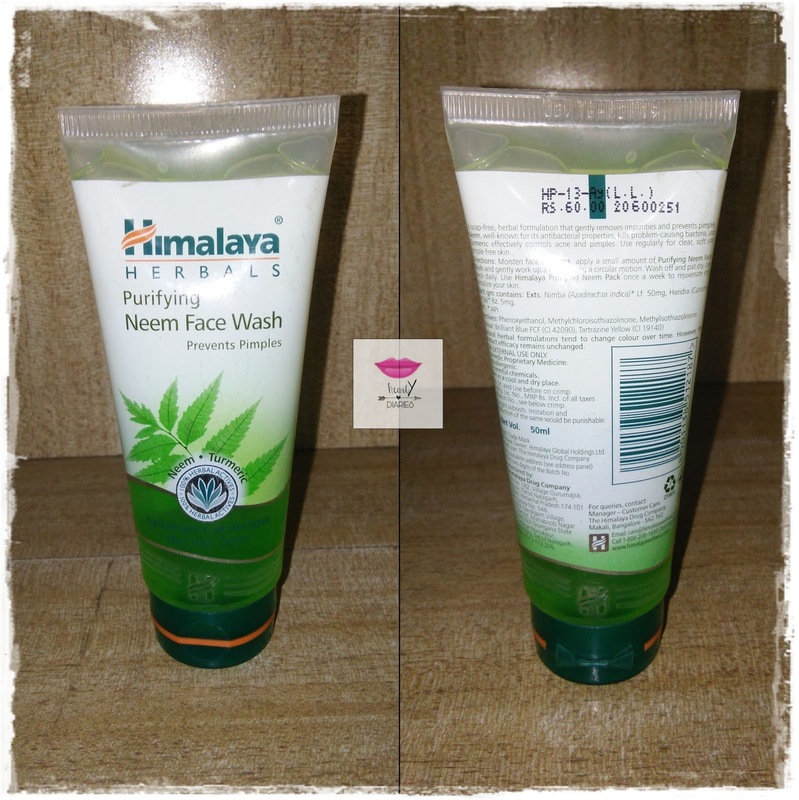 If you are someone who loves taking care of your skin by adopting natural methods, go for this face wash. Opt for this one if you have acne, pimples, breakouts or any other skin problems in addition to oily skin. This face wash reduces blemishes and scars and controls oil for a good amount of time. 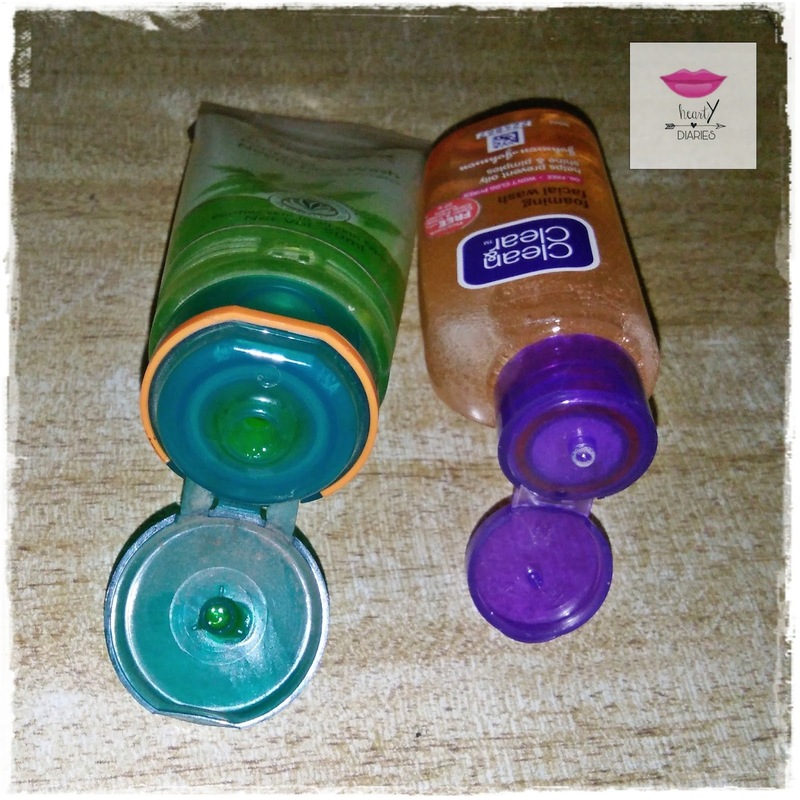 What I really liked about both of these is there packaging which is really sturdy, secure, tight and travel friendly. I also read in some reviews that these facial washes may not work for dry skin to which I would prefer mentioning that it is already written on the packaging that they are mainly meant for controlling oil and dealing with skin problems. I too, however, feel that it may be a little more drying for the people having dry skin out there. My reviews are based upon my personal experience having an excessively oily skin.